Create an Email Campaign-Beasley Direct and Online Marketing, Inc. The most important word in consumer personal loans is “You’re Pre-Approved.” Our client, NetCash123, profiled their consumer database and searched for customers most likely qualified to receive a personal loan. Then, tasked us to create an email campaign to approach them. 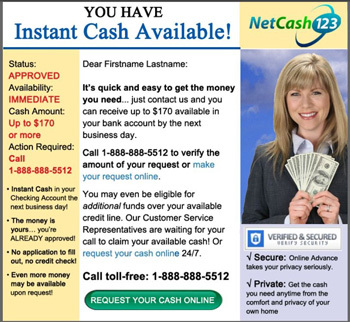 Our email emphasized how quickly and easily they could get the cash they needed, and the magic words “You’re Pre-Approved” were emblazoned near the top. Before you create an email campaign, contact a Beasley email expert. You’ll save time, money and get targeted results.